I didn’t blame him. The kid has never known a world without Google. While I am a digital immigrant, he was born into this connected world. Broadband, Youtube, Facebook were his birthrights. It is oddly paradoxical that while he is so connected online, he was awkward around people in general and suffered from social anxiety. After meeting everyone at the Asheville airport and during the bus ride to the camp, he was quiet. To an outsider, he seemed to be busy checking his phone while periodically looking up to see the world passing around him. But I knew that being in a bus full of strangers and the thought of spending the next four days with them filled him with dread and he was trying his best to avoid any eye contact or interaction. When we first observed his behavior, we explained it away as a part of his normal development, or part of his temperament. It wasn’t until recently that we learned social anxiety disorder is also called a silent disorder because it can affect children for years before it is diagnosed. As children grow and mature, they learn how to avoid being the focus of attention at school or home; as a result, their extreme discomfort in social situations can go unnoticed. We tried giving him the opportunity to speak for himself in situations such as ordering in a restaurant or asking movie tickets. But he found excuses and work around to avoid them. 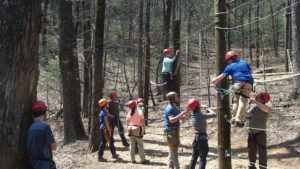 As expected, when we started the first activity – the ropes course, he wanted to know if he could opt out. “That’s not an option,” I said. And to my surprise, he didn’t complain. He was slow and methodical, horrified at the thought of embarrassing himself in front of strangers, but he completed the course. He was covered in sweat and shaking from the experience, but he had done it. Over the next three days, I saw him starting to trust himself. With each team building activity, I saw him slowly injecting himself to the social mix. 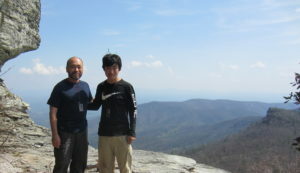 During the tough hike with a heavy pack to the summit of the Table Rock Mountain, he discovered that he was stronger than he believed. While observing him, I learned to be more compassionate, patient and generous with him. I had been hard on him in the past, pressuring him to “just don’t think about that stuff” or “come on, man up.” I didn’t fully realize the inner turmoil he was experiencing. 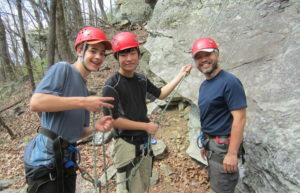 During the rock climbing activity, I saw how he overcame his anxiousness to respond to his partner’s needs as a belayer. 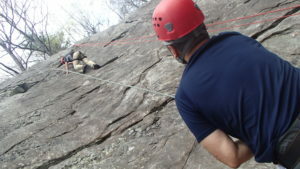 As a climber, he was able to think strategically and make choices while ignoring the fact that whole group was watching him. In the past, being the focus of everyone’s attention would have been unthinkable. One night, he said “It is beautiful out here. I wish we can stay longer.” This was not something he would have said in the past. Normally, he would be so uncomfortable with the social situation that he couldn’t wait to get back to the safe confines of home. He was coming out of his shell and starting to enjoy the experience. It was a small but an important step. I was very proud of him and loved him for trying. I know that he would experience setbacks as well as successes in the future. It was a journey I would take with him as long as he needed me. I knew with certainty that one day, he would be strong and confident enough to continue the journey by himself. I open my eyes and am struck by the beautiful young man before me, and was thankful to have shared in the experience.